Got a spare five grand and twins? Because the ‘Bentley’ for babies just got bigger. Read on. The Silver Cross Balmoral pram is a nursery icon – not only is it the baby carriage of choice for royalty, but a long list of celebrities are also taking their babies for ‘a turn around the gardens’ in timeless style (the Pitt/Jolie, Lopez, Spelling, Ritchie, Kidman and Murdoch families are fans, to name a few). No longer the domain of singletons, the Balmoral is now built for twins and delivers all the comfort, style and luxury that we expect in a Silver Cross heritage pram. The Twin Balmoral is hand-built in Yorkshire and features a hand-sprung chassis cushioned with leather suspension straps, chrome handspoked wheels, two reclining hoods, beautiful upholstery, quilted mattress, wooden handle and a high gloss onyx black finish. 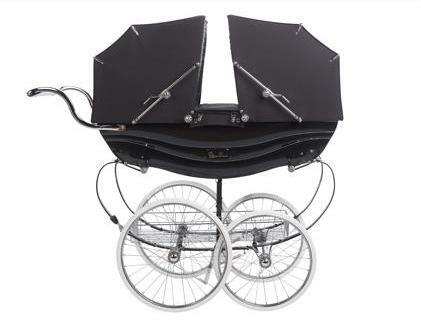 For its $4999 price tag you are getting one hundred and thirty years of baby carriage style, history and experience as well as a mighty fine twin pram. The Twin Balmoral will be available in Australia in July 2010 from Silver Cross.